Polo – Dominic Rödel – Interaction Designer. Polo – A tool to enable exploration and discovery for visually impaired. 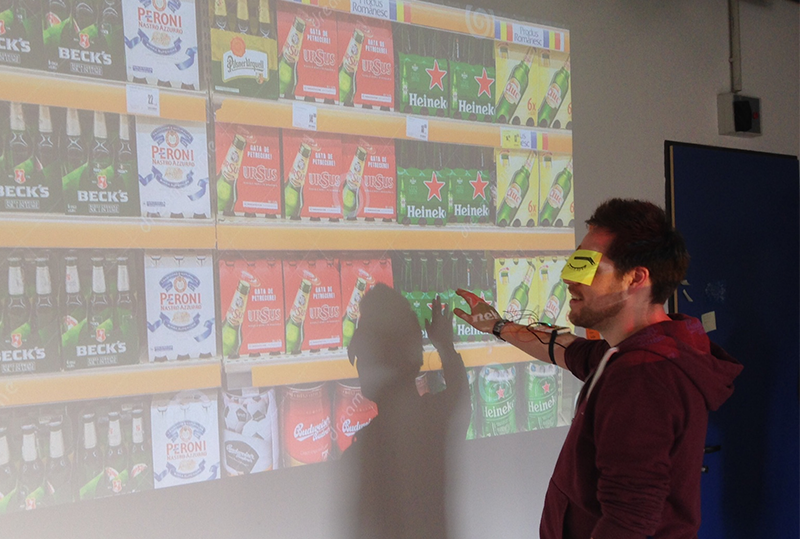 Polo is a discovery and exploration tool for (not only) visually impaired people in the context of grocery shopping. It consists of a companion app for the smartphone and a smart bracelet equipped with a bone conduction hearing aid and vibration motors. Depending on movement patterns, audio information about the surroundings and vibration patterns about directions are presented to the user. Polo had been shortlisted for the 2016 Interaction Awards in the category “Empowerment” and was running for the People's Choice Award. A detailed case study including the research can be found on Medium. Visually impaired people keep buying the same things over and over again since they know where to find them. Free exploration and stepping out of known habits is a struggle and considered luxury. With our concept for Polo we wanted to find an answer to the questions: How can we help visually impaired people to not only find any item in a store but encourage discovering completely new products and how can we help them to expand the mental model of a supermarket to give back autonomy in their daily lives? Polo consists of two parts. A companion smartphone application optimized for use by visually impaired people and optimized for the use of voice-over functionality giving the user a smart way to organize his shopping list and get product location information. 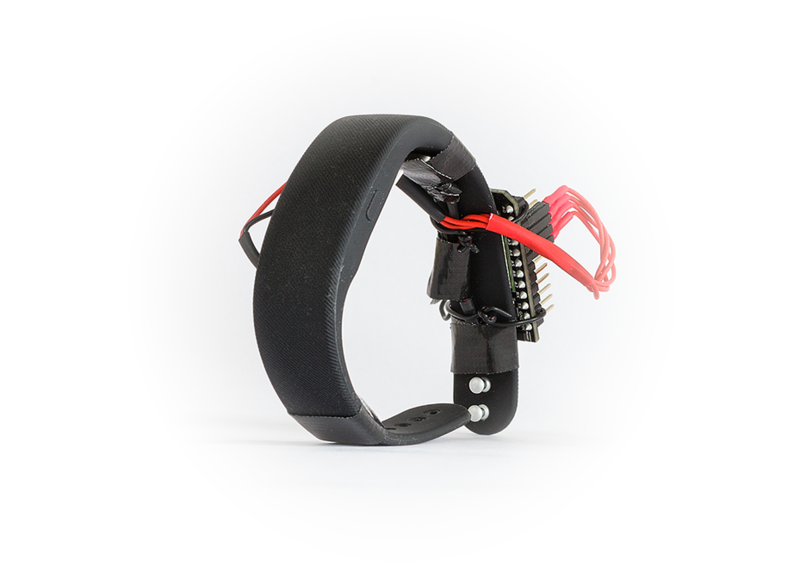 The main part of Polo is a smart wrist band equipped with four vibration motors giving the user directional information by vibration patterns guiding him not only through the store but to a specific product within a shelf. Additionally Polo is equipped with a bone conduction hearing aid (leaving the ears free to still be able to hear everything around) and giving the user product information depending on his movement patterns. By moving around freely the user gets audio information about the main categories of products that are around him in combination with subtle vibrations about the spatial information. The slower he moves the more detailed these information get. This way the user gets a more and more detailed image of the supermarket just by walking around. Considering that everyone already has a certain mental model of the supermarket in his mind, usually based upon experiences or expectations, this technique of presenting information helps filling the blindspots of this mental model. "Vibration motors are used to guide the user spatially, bone conduction audio gives product information depending on movement patterns." There are various levels of impairments we tackle with Polo. Permanently impaired and blind people that want to find a specific item or discover new products. Temporarily impaired people that may have visual dysfunctions. Situational impaired people, for example people in a rush looking for something specific or people that are in a new supermarket for the first time not knowing where products are located yet. Polo is a great way for supermarkets to help users find things free of a hassle and let them spent more time in a the store by letting them explore new things giving product information about things they haven't tried yet. To test and validate our concept we built a first prototype using tape, wires, vibration motors and a spark core micro controller. The technology needed in a real life use is not far fetched at all and would require bluetooth localization to detect the actual position in the store and NFC chips on the shelfs or products to detect which of the items is approached. During our research we realized quite some chains of grocery stores are already equipped with at least NFC technologies on the price tags to quickly change prices for example. Being just a matter of time until technologies like these are more common we realized it would be the simplest way to use these existing structures. As a proof of concept we decided to prototype what felt more important to us then the technological feasibility – the experience. Could a user expand his mental model and find something in a grocery store by being presented with audio information and vibrational patterns? To test this we remote controlled our prototype and the user in a virtual grocery store triggering vibrational and audio information by ourselves. To test how the user can distinguish between vibrational patterns we connected four vibration motors to a spark micro controller. We found out that distinguishing between the four vibration motors for direction works surprisingly well, even though we just used remote controlled commands to lead the user and the hand to a specific product. At any point the users always had a clear idea about what is surrounding them, even though they didn't see it. Exploring the virtual supermarket and finding items they had on a shopping list was very promising. 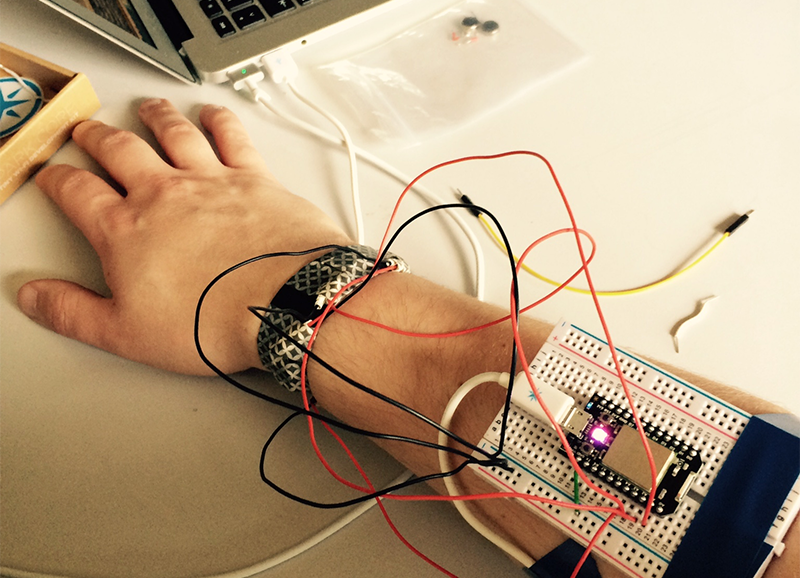 Testing the prototype using remote controlled vibration patterns – Human intelligence simulating the NFC and Bluetooth based AI. The idea behind Polo can be difficult to grasp by description or infographic alone. Thankfully Bio Company – a supermarket chain specialized on organic food – allowed us to shoot in one of their stores. To illustrate how Polo works from a user perspective, we decided to shoot a short movie clip, quickly making a point for the importance of autonomous, hassle-free grocery shopping for the blind. The movie reflects on the user’s journey through the grocery store, picking up any item he or she has on the list as well as exploring yet unknown products along the way. This concept of contextual information dependent on movement patterns presented to the user by vibrational patterns and audio information easily adopts to other scenarios where a user finds himself in a more or less unknown three dimensional information space. Imagine a library guiding visually impaired people to the book they want or pretty much everyone within a museum using an audio guide: Changing the density-level of audio information dependent on the way a user moves through the museum, resting longer at works he finds interesting with more detailed information and rushing through parts he doesn't care about at all with very basic information, seems like a very promising base for an audio guide – not only for visually impaired. The project was a great chance to realize how important human centered design is and how everyone somehow is dealing with impairments. Polo was well received by Microsoft employees at the final presentation in May 2015 and had been shortlisted for the 2016 Interaction Awards in the category “Empowerment”. Additionally Polo was running for the People's Choice Award. You can find the complete project documentation and images including our research and physical prototyping on our Medium blog. This was my first intersection with the field of inclusive design and it turned out to be a great experience. Compared to a more technology driven design approach, working on Polo clearly was human centered design at its best. With the redefinition of the term "disability" all of us are now struggling with handicaps in certain ways. The Research-Phase as a base for our design work was bigger and more deep then on any other project before and probably the main reason for the quality of the outcome. Design never happens in an empty space and it is fundamental to understand these surroundings to make proper decisions.